Where are the files and settings? Open ports 1716-1764 for TCP and UDP and allow broadcasts. When a problem requires detailed information to debug, you may use the built-in function for generating a support log. 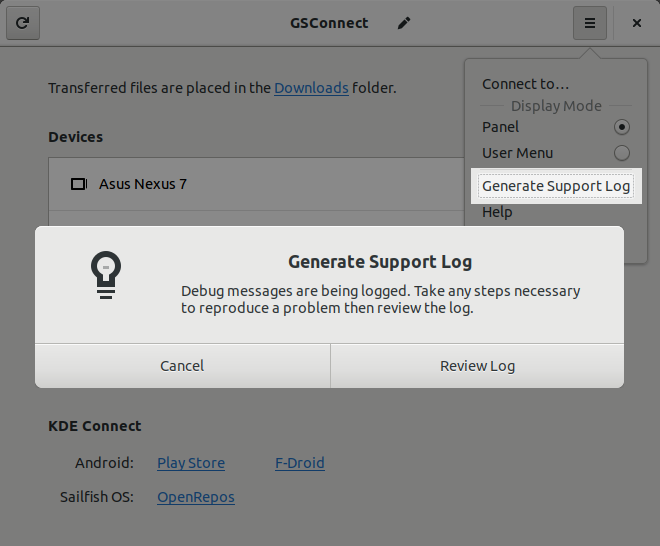 The log will contain information about your desktop, GSConnect and detailed debugging messages. Once the dialog opens, you should take any steps necessary to reproduce the problem. You may leave the dialog open as long as necessary to gather the required information. When you click Review Log the contents will be opened in the default text editor. Before you submit this log you should remove or censor any information you consider private. Cached data is stored in the user cache directory under gsconnect; usually ~/.cache/gsconnect/. Cached data specific to a device is stored in a sub-directory. Plugin data is also stored in memory when in use, so you must disable a plugin before deleting its cache. To completely remove a device and all it's settings, use the button in the Advanced page of the device preferences. Some phone models or apps seem to have trouble exporting contacts. Please see Issue #277 for more information. There are two ways to sync your contacts, but neither are required. If you would like to sync your contacts from Gnome Online Accounts or Evolution, please see Desktop Contacts in the Optional Dependencies section. You should disable the Contacts plugin for any devices that you want to fallback to desktop contacts. If either of these methods fail, GSConnect will try to gather contact information from incoming phone calls and messages. Some phone models (especially Samsung) and SMS apps (especially Signal) either don't use the standard Android database, encrypt messages or use proprietary methods for storage and access. Please see Issue #320 and KDE Connect Bug #401677 for more information. Remote mouse and keyboard is only available for X11/Xorg sessions and will not function in Wayland (see Wayland + Accessibility). You must install Caribou to support Unicode characters and keyboard modifiers (Alt, Shift, etc). It has been reported that Remote Input will not work if GNOME Shell is not started by GDM. A common example is starting GNOME Shell using startx. In this case, your logs may contain messages such as Keystring synthesis failure, string=a. org.gnome.Nautilus.desktop can be replaced with another file manager or application if desired. 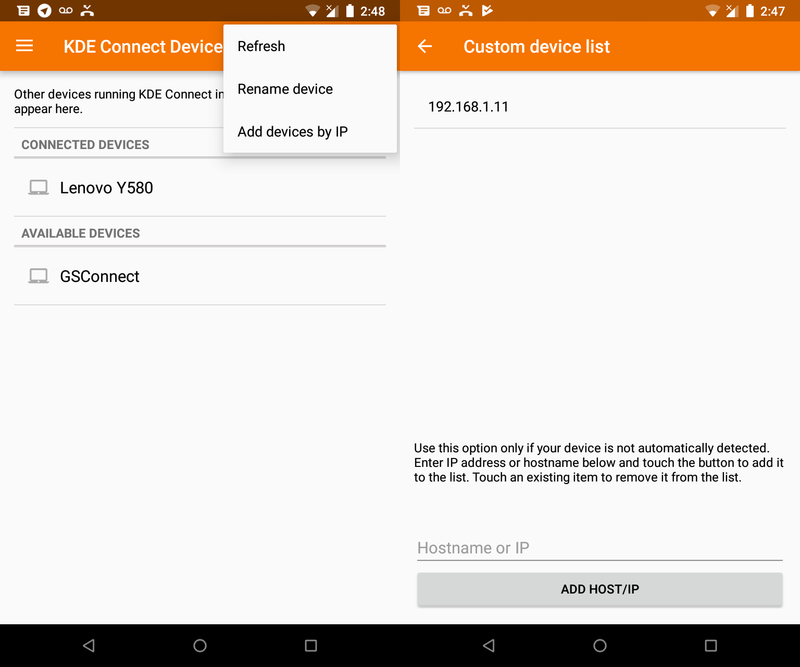 Some users have reported that KDE Connect broadcasts (UDP Port 1716) can interfere with some equipment. The cause is unknown, but seems to only affect very very network connected devices such as PLCs and WiFi repeaters. These problems are automatically detected. Do not edit this section. GSConnect requires ports 1716-1764 for TCP and UDP. This error means another program is using those ports, usually KDE Connect (kdeconnectd). If you have recently uninstalled KDE Connect the server may still be running. You should also uninstall KDE Connect, since it will start each time you log into your session. This error means a connection failed to connect or authenticate with the network proxy. 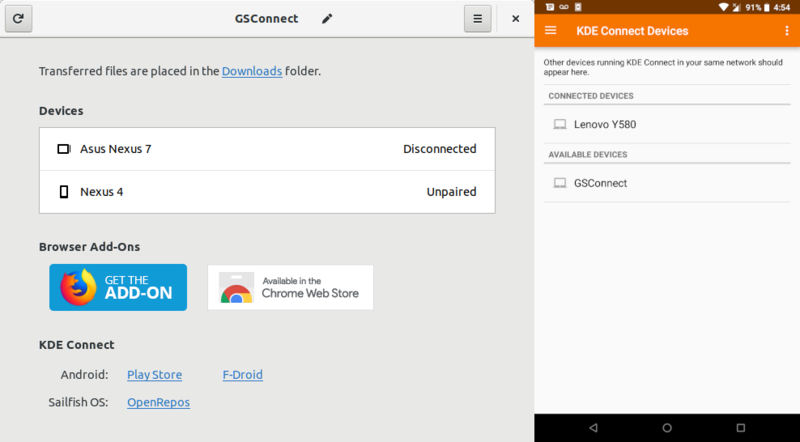 As a rule, neither GSConnect nor KDE Connect (#376187) will use the system proxy. 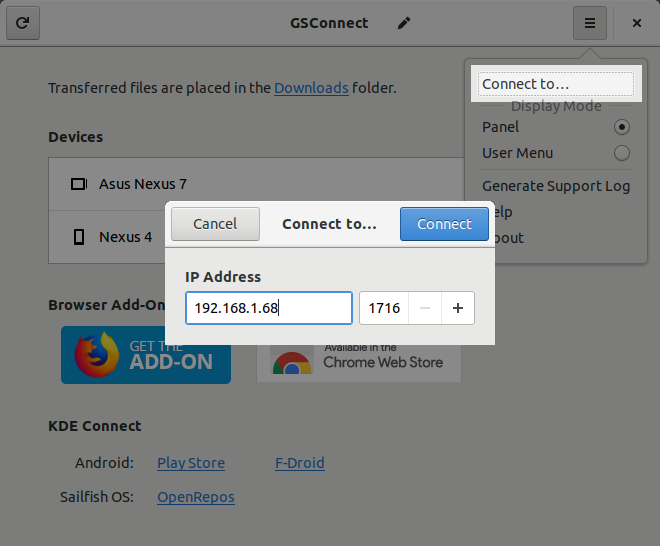 If you require GSConnect to open connections through the system proxy, please open a New Issue and be prepared to help test. GSConnect uses the PulseAudio bindings shipped with Gnome Shell for volume control features. This error means that GSConnect failed to find the required typelib (Gvc-1.0.typelib). 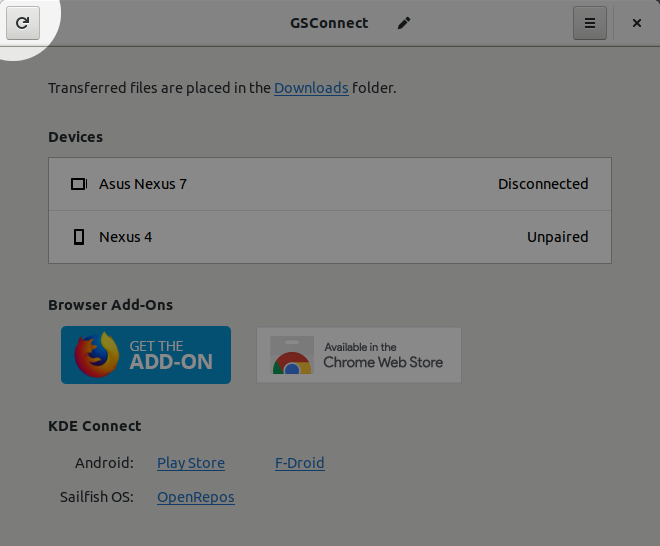 If you installed GSConnect from https://extensions.gnome.org or Zip file, please open a New Issue including your distribution and output of locate Gvc-1.0.typelib. If you installed GSConnect from a distribution package, please file a bug with the package maintainer and reference the Packaging page.